MANILA, Philippines - (RELEASED. Updated May 17) The March 2018 Civil Service Exam results or Career Service Examination-Pen and Paper Test (CSE-PPT) full list of passers and topnotchers (top 10) for professional and sub-professional level are released on May 16, 2018 or in 60 calendar days after the exam. The first CSE-PPT this year was conducted by the Civil Service Commission (CSC) on March 18, 2018 (Sunday) to more than 200,000 aspiring civil servants in 61 testing locations nationwide. This also covered examinees from Iligan, affected by the hostility in Marawi City last year. UPDATE: CSC named a total of 25,602 passers of the professional level and 4,573 successful examinees of the sub-professional level. See statistics below courtesy of csc.gov.ph. The test has the objective of establishing Register of Eligibles (RoE) from which certification and appointment to first and second level positions in the civil service, except those involving practice of profession and/or covered by special laws, provided the eligibles meet the qualifications and other requirements of the positions. Passing CSE-PPT Professional Level gives second level eligibility appropriate for both first level (clerical) and second level (technical) positions in the government. Meanwhile, Sub-Professional Eligibility means passers are appropriate only for first level positions in the government. "The list of passers shall be uploaded/posted on the CSC website www.csc.gov.ph within 60 days after the examination," the commission announced. In previous examinations, results were out online within 41 days after the test. We advise takers to monitor announcement of results between May 15 to May 17 (Tuesday-Thursday) or in 58-60 days. Note that results may be released earlier or on later date due to unforeseen circumstances without prior notice. 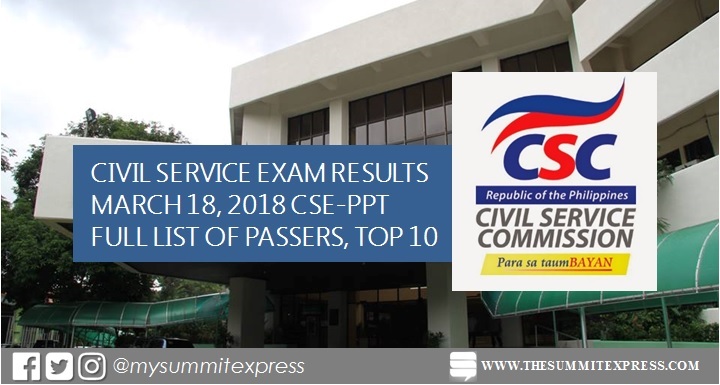 The Summit Express, a website which covers civil service examination for about six (6) years, will ensure all of its readers and followers on social media to get updates in few weeks or days before the announcement of results. Passers are those who obtained a general rating of at least 80% on CS exams. They shall be issued a Certification of Eligibility (CoE) printed on CSC letterhead, free of charge. In the March 2017 CSE-PPT, results were released online after forty (40) working days. A total of 25,090 (21,640 for the professional level and 3,450 for the sub-professional level) out of 230,736 takers (10.87%) passed the exam. Michael Louie D. Lim from Northern Mindanao, with a rating of 92.45, topped the 188,528 examinees of the Professional exam, while Faye S. Cruz from Metro Manila, with an 89.12 rating, placed first among the 31,169 hopefuls of the SubProfessional level. In the April 2016 examinations, results were announced after 39 working days. A total of 25,276 out of 229,463 examinees or 11.02% passed the CSE. 22,041 conferred the civil service Professional eligibility, while the 3,235 of the successful examinees received SubProfessional eligibility. With a rating of 92.36, Hannah Ivyn Hazel Damian from NCR bested the 187,720 examinees of the Professional level. On the other hand, topping the 29,797 SubProfessional examinees was Jerome De Chavez, also from NCR, with a rating of 88.28. For the March 2018 CS exam results, takers may also expect of passing rate around 11% or can be translated to around 26,000 passers for both levels of exams. Both levels of exam covered General Information items: Philippine Constitution, Code of Conduct and Ethical Standards for Public Officials and Employees (RA 6713), peace and human rights issues and concepts and environmental management and protection. Those who missed the filing for March 2018 exam may get exam on the second CSE-PPT this year, on August 12. The period for filing of applications is on April 10 to June 22, 2018.